Today was born one of the greatest priests of the Catholic Church who died a Prince of the Church. John Joseph O'Connor was born on January 15, 1920 to Mary Gomble O' Connor and Thomas O' Connor. He was the fourth of five children in a working class family. John O'Connor was educated by the Christian brothers and felt called to religious life. At the tender age of 16, he entered St. Charles Borromeo Seminary in Philadelphia. It took nine years of study and he was ordained on December 15, 1945 at the age of 25. He would later work as a diocesan priest. O' Connor was then called to minister to our armed service men. 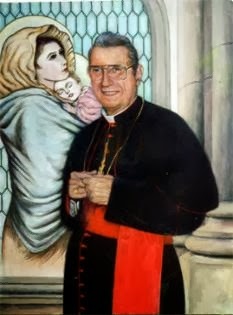 Cardinal Spellman, the Archbishop of New York at the time needed chaplains for the Armed Forces and Father O'Connor did not hesitate to answer the need and would work in the Navy as chaplain. He remained there for 27 years and was even made a Rear Admiral and Chief of Chaplains of the United States Navy. 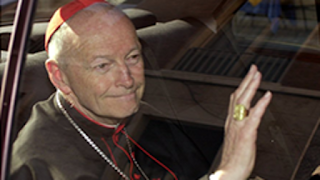 In 1979, he was ordained an auxiliary Bishop and worked under Cardinal Cooke in the Military Vicariate. remain Archbishop of New York until the year 2000 when he passed on to meet His Lord. Cardinal O'Connor was the embodiment of what Pope Francis is asking priests, religious and laity to be today. He worked for the poor, the sick - especially the disabled who he was fond on. His mother became blind when he was young and this left an impact on him. He made it a priority to be there for the disabled and always celebrated their Confirmation. Cardinal O' Connor ministered to the poor and was close friends with Blessed Mother Teresa of Calcutta. The Cardinal approved the first specialized AIDS unit to provide care to AIDS patients which was the first of its kind. There he would care for AIDS patients by cleaning their bedpans and even their sores, many who were gay. The LGBT community did not like him at all despite his care of gay AIDS patients. 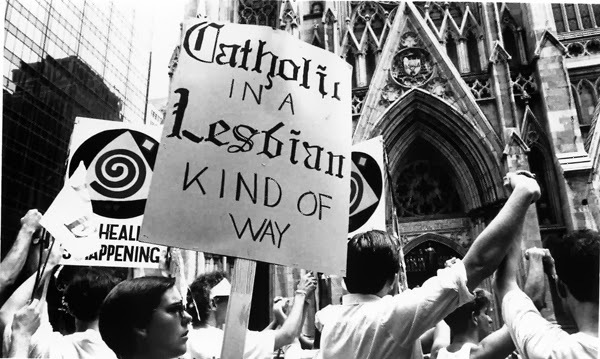 They would mock him during "Pride parade" events and even disrupted Mass at St. Patrick's cathedral when a group of gays from ACT UP entered the historic building, some chained themselves to pews, others took Holy Communion, smashed it in their hands, threw the remains, spat and stomped on the sacred species while saying, "this is what I think of your God." 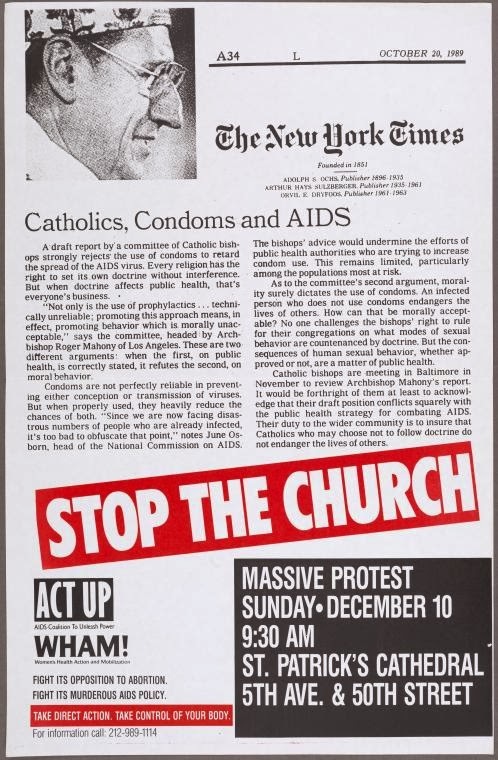 Despite this, Cardinal O' Connor forgave them and made it clear by staying, "I must preach what the church preaches, teach what the church teaches." 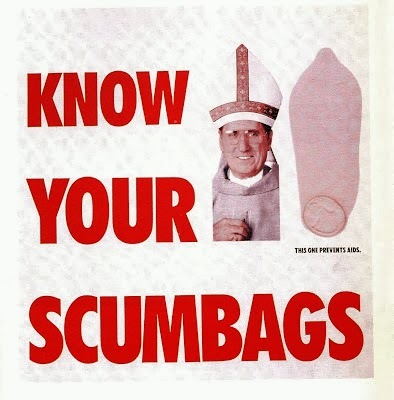 The Cardinal was very outspoken against homosexuality and this earned him many enemies in the LGBT, Pro-Abortion and liberal factions including radio personality Don Imus. 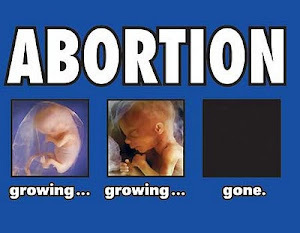 Nevertheless, he did not shy away from the teachings of the Church on this issue or on other issues such as abortion, contraception and euthanasia. To date, the NYPD places barricades to protect Catholics from the gay community during their "Pride" events. Even after his death, the LGBT community still held a grudge. A gay publication published a satire image celebrating his death by "dancing on his grave." Time Out New York published an article expressing joy and relief after his death and wrote: "The press eulogized him as a saint, when in fact, the pious creep was a stuck-in-the-1950s anti-gay menace. Good riddance!" 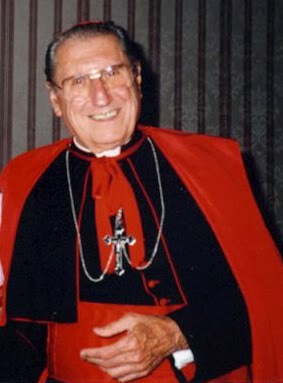 Carmen Vazques of the Lesbian and Gay Community Services Center stated that the Cardinal made the lives of the LGBT people miserable with his comments and opposition to their way of life. There probably has not been a prelate so aggressive in the Pro-Life movement than His Eminence, John Cardinal O' Connor. O' Connor was firm on his adherence to the Church's teachings on life and abortion. He was so dedicated to this that he founded the Sisters for Life who exist to help pregnant women and to discourage abortion. The Cardinal even offered to take care of expenses for any woman seeking an abortion, even providing a car to help them. It was he who ordained the well known Fr. Frank Pavone of Priests for Life and allowed him to work at Priests for Life as director. Aside from wearing his clerical collar and suit, he would wear a rose lapel pin with the words "LIFE." He fought for those who were targets for euthanasia and emphasized the Church's teachings without compromise. 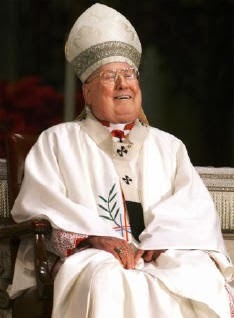 Cardinal O' Connor coined the phrase "Cafeteria Catholic" when he said, "The Church is not a salad bar, from which to pick and choose what pleases you." 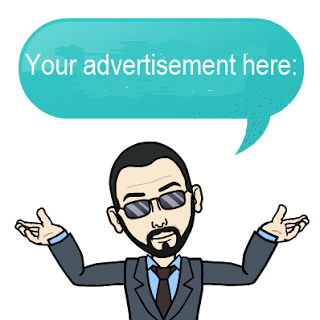 He did not waiver in his role as shepherd and evangelist. 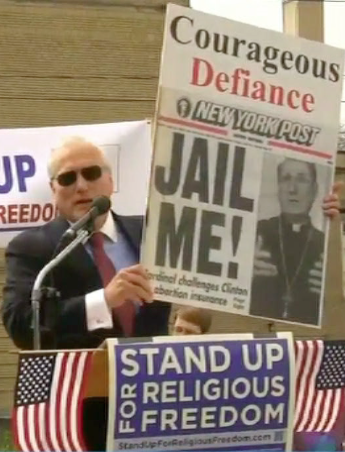 When President Clinton was pushing his pro-abortion agenda which threatened Catholic hospitals with legal action as well as free speech, the Cardinal responded with, "Jail Me." He also made it clear that he will close hospitals if necessary to prevent them from becoming havens for abortion, euthanasia and contraception. As required by Canon Law, Cardinal O' Connor submitted his resignation at age 75 to the Vatican. 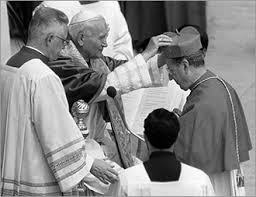 Blessed John Paul II did not accept it and asked him to stay on longer which Cardinal O' Connor did. In 1999 he was diagnosed with a brain tumor which was inoperable. Like Blessed John Paul II, he did not hide from the public. He celebrated Mass, and continued his schedule despite health visibly deteriorating. The Cardinal who was known to be agile and have a "New York" swag-walk in his step, was having difficulty standing and even fell at the Cathedral during Mass. He swelled up due to the cancer treatment and even joked about it by referring himself as "fat head." The Cardinal met his Lord on May 3, 2000. His funeral Mass was packed to capacity with dignitaries such as President Clinton. When his work against abortion was mentioned, the people stood up in an ovation that lasted over five minutes which left President Clinton and other pro-abortion politicians dumbfounded and embarrassed. He was laid to rest in the crypt under the high altar. He received the Jackie Robinson Empire State MEdal of Freedom by Governor Pataki and the Congressional Gold Medal by the US Congress and President Clinton by unanimous vote. A campus in the Bronx of the College of New Rochelle on 149 street was named after him. Cardinal John Joseph O' Connor is a model prelate that should be imitated. He was stern when he needed to be and gentle at all times. Like Pope Francis and previous recent Popes, he only wished to be known as a simple priest who worked humbly in the Lord's vineyard. The Cardinal courageously defended the unborn, the poor, the disabled, AIDS patients and the Catholic Church's teachings without compromise. He was a true shepherd and faithful priest who did not water down the doctrines and dogmas of the 2000 + year old Catholic Church of Christ in order to conform to the times. May he rest in peace and pray for the Militant Church still in the war on Earth against evil, the culture of death and immorality.